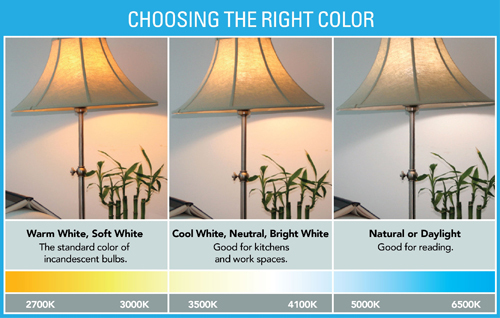 - Light color is measured on a temperature scale referred to as Kelvin (K). - Lower Kelvin numbers mean the light appears more yellow; higher Kelvin numbers mean the light is whiter or bluer. - For a Warm White Light, look for bulbs marked 3000-3500K. What is the difference between Cool White and Warm White LEDs? LED's mostly come in different colors. The well-known colors are Cool White and Warm White. Cool White is a brighter option, often used in larger rooms, hospital, shows, scholls and modern sorroundings. Warm White is the closest colour to a traditional incandescent or hallogen bulbs. This color is used in the house, in most rooms, kitchens, living rooms, etc. It will create a much warmer and ambient light feeling.